ArtsWorks @ Pacific Grove Third Friday Artwalk! Name: ArtsWorks @ Pacific Grove Third Friday Artwalk! Come by ArtWorks @ Pacific Grove, a haven for local artists, for their Third Friday Party! 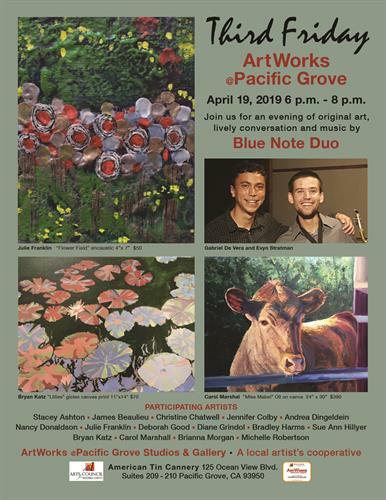 Join us for an evening of original art to enjoy or purchase, live music performed by the Blue Note Duo and refreshments! Free to the art and music loving public!